I led a study at the Toronto Rehabilitation Institute-University Health Network regarding the use of specialized red-nosed clowns, referred to as elder-clowns; the most recent development in arts-based approaches to dementia care. Elder-clowns use improvisation, humor and empathy, as well as expressive tools such as song, musical instruments, and dance to engage nursing home residents. The results are magical! The ability and desire to be deliberately playful with others is typically not a capacity ascribed to persons with dementia living in nursing homes, who are instead more commonly characterized as the “living dead”. Yet in this 12-week program where elder-clowns interacted twice weekly with residents of a nursing home in urban central Canada, the residents initiated, modified, and co-constructed exquisite moments of empathetic, creative, and playful engagement using verbal and non-verbal communication. 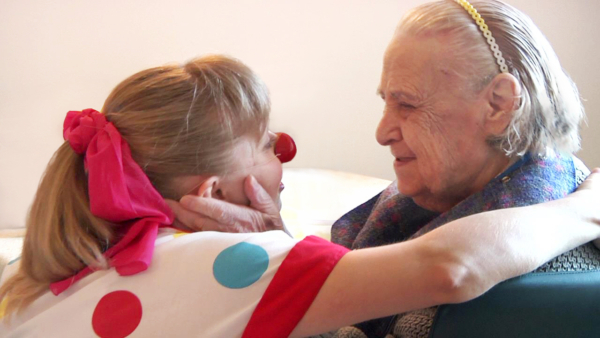 These magical moments were captured in 66 hours of videotaped interactions between the elder-clowns and residents. Significant outcomes of the interactions were measured and included reductions in agitation and other neuropsychiatric symptoms, as well as improved quality of life. Examples of interactions included: song and music, such as singing with residents their favorite songs with the accompaniment of a ukulele, or co-constructing with them improvised songs; witty, playful scenarios involving, for example, residents teasing the elder-clowns by playfully pretend-kicking their buttocks as clowns bent over, to which the elder-clowns responded with exaggerated pratfalls, sound explosions, and facial animations; elder-clowns supporting sadness with a soft reassuring touch rather than trying to change residents’ emotional tone; and artistic expression by residents through the elder-clowns’ provision of pens and sketch pads, or more imaginative engagement of residents such as an elder-clown creatively miming an artist painting a canvas. A distinctive feature of elder-clowning is their reliance upon biographical details to tailor their interactions to the uniqueness of each individual resident. For Frank, a resident who had been a delicatessen owner for his entire working life, his recounting to the elder-clowns of the meats he had once sliced and sold in his shop was spontaneously transformed by them into a joint lyrical story that joyfully reminisced another place and time. What began with Frank slowly and rhythmically repeating, “corned beef, pastrami, baby beef, smoked meat, tongue sandwiches,” was first mirrored in tempo, gesture, and emotion by Cherry and Zazzie. Upon sensing Frank’s increasing delight when they did so, each clown then began to clamour with higher pitched shouts of “pastrami!” and “baby beef!” Responding to their enthusiasm, and upping the excitement of the play, Frank then began to holler “smoked meat!” as he wildly waved his arms and waited for the clown duo to shout back their response, “tongue sandwiches!”. We have a collective responsibility to ensure persons with dementia are afforded every opportunity for self-fulfillment and elder-clowns, with their unique training to support verbal and non-verbal communication and affect, provide an important contribution to the long-term healthcare team. Elder-clown programs are prominent in Australia, Scotland, and more recently have been implemented in some long-term care homes in Toronto, Ontario. For information about elder-clown programs, contact Melissa Holland, Co-founder of the Jovia Foundation (mholland@jovia.ca). For more information about the research study, contact Dr. Pia Kontos (pia.kontos@uhn.ca). 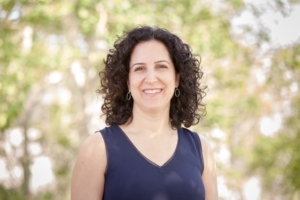 Dr. Pia Kontos is a Senior Scientist at Toronto Rehabilitation Institute-University Health Network and Associate Professor at the Dalla Lana School of Public Health, University of Toronto. Her current research program represents a convergence of several key interests or themes: the use of critical social theory and qualitative research methods to examine the norms and assumptions underpinning care practices in long-term care and rehabilitation settings; a philosophy and approach to person-centred care that emphasize embodied selfhood (the importance of the body–its movements and gestures–for self-expression), individualizing care and psychosocial interventions in the clinical area of dementia; and the development, implementation and evaluation of arts-based approaches such as research-based theatre, improvisational drama, and film to bridge social science research on relational care with practice in long-term care and rehabilitation settings.